Website promotion is a vital tool in keeping one's operations successful. That said, businesses, ngos and government offices alike are often not aware of how to make their promotion effective on the Web. Web popularity is complicated. It's not the traffic that counts, but rather the quality of engagement. Be certain that your website is well-designed and has a clear pitch, whether that's to promote your business or to save the rainforest. If you want to have your site listed and featured online search engines, make sure that your web documents have keywords in the META tags. This in turn increases the chances that the digital "robots" run by the search engines find your site. Where else to get hits? Surprise of surprises, the most loyal traffic is a result of reciprocal links, starting with web links. Synergetic web marketing shows technical and social savvy. Planeta.com can help publicize your website in an ethical and effective manner. Here are some ways we can be of assistance. TOURISM BOARDS -- If you need to rethink and retool your web site and web presence, learn from the best and avoid making common mistakes. LANGUAGE SCHOOLS -- If your site promotes a specific Spanish language school, advertise online our website. EVERYONE -- If you see other ways that you can benefit from appearing online Planeta.com, consult our Rate Card and Alliances. 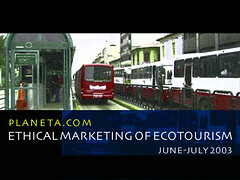 Planeta's international conference combined discussion of ethics and marketing in the realm of developing ecotourism. One all-time popular feature is Marketing Ecotourism on the Web. Don't forget the natural world! Make sure that your brochures and business cards have the correct URL. Good word-of-mouth is always an excellent promotion. Create a series of banners for your website that colleagues can use when linking to your site. Here's are examples from our collection and Worldtourismdirectory.com. Where should you advertise? Make sure that the website receives traffic. Some websites can provide documentation of how many hits go from their site to yours. You can also track in-coming hits. There are several search engines that allow you to purchase hits via bidding on key words. You can either pay-per-click or pay-for-inclusion in a directory. In the case of Google, you can pay-per-click. Here is there pitch: "More than 150 million times a day, people use Google to find what they're looking for. Make sure they find what you're selling. Create a text ad that appears next to Google and partner search results. You decide which searches show your ad and what you're willing to pay for each new customer who clicks on it." In your emails always put the 'http://' in front of the URL -- this activates the link in most browsers. Webmasters receive requests all the time that if they pay a fee, their site will be submitted to hundreds of search engines, thereby attracting thousands of visitors. Honest marketers have a track record. They don't address messages "to whom it may be concerned" and yet that is how many individual website owners receive junk mail about getting one's site listed on 1,000 search engines. My advice -- don't even respond to junk mail. One of the best things about the Web is that it serves as a tool for both education and promotion. There are numerous journals that select the best resources to highlight for their readers. A caveat. These sites have specialized interests and before submitting a post, make sure that you review the home page and that you are in accord with the publisher. Example -- resources which monitor international financial institutions (IFIs) such as the World Bank, the IMF and regional development banks are invited online IFIwatchnet.